Trees and shrubs add much when it comes to curb appeal. 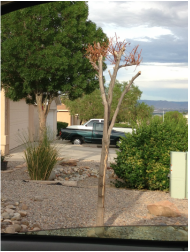 Evergreens and drought tolerant plants can really enhance a xeriscape. It can be quite simple to add these features and if you include a drip system then the maintenance is quite low. 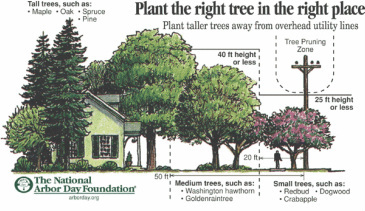 There are some things to keep in mind when planning your design and considering installing trees and shrubs. Consider the area that you want to put the plants. Is it full sun? or full shade? Is it in the lawn? Is it in a xeriscape? Is it deciduous (will leaves fall in the winter)? This is important to know so that you can be prepared to have some fall cleanup. How often does it need to be trimmed? Do you want flowers, fruit, colorful leaves? These are just a few questions to consider when looking to add a tree or shrub to your landscape. Each month we feature different trees and shrubs at a discount price. Check back every month and see if we offer the one you are looking for. 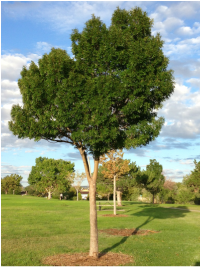 Call us about our tree and shrub application program to keep your investment healthy and strong. 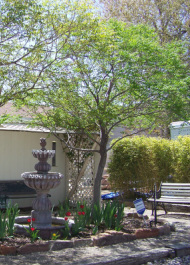 Trees and shrubs should be watered every 10 to 14 days. 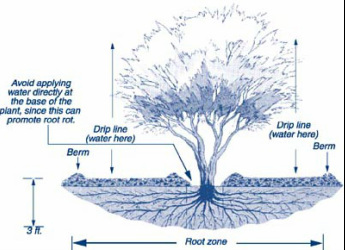 Ideally the soil should be moistened to a depth of 3 feet over the root area. Evaporation can be kept to a minimum by maintaining mulch around the base of the plant. Fruit trees will require a consistent watering schedule to avoid drought stress. Drought stress will keep fruit from growing to it’s full size and can reduce the fruit’s flavor. Don’t forget to thin fruit when necessary to keep branches from breaking. Do not fertilize your trees and shrubs during the hot summer season. two weeks is the best way to keep your trees and shrubs watered. Most people think they should be watering at the trunk, but by doing this you may be encouraging root rot. hose out to the outskirts of the canopy. Remember that the root system extends all the way out to the edge of the canopy. Shrubs also need to be watered around the drip line, but for a lot less time. Most shrubs are on timers with bubblers or drip, which work the same way the soaker hoses do. If your shrubs are looking droopy make sure your drip system is working properly especially as temperatures start to rise. 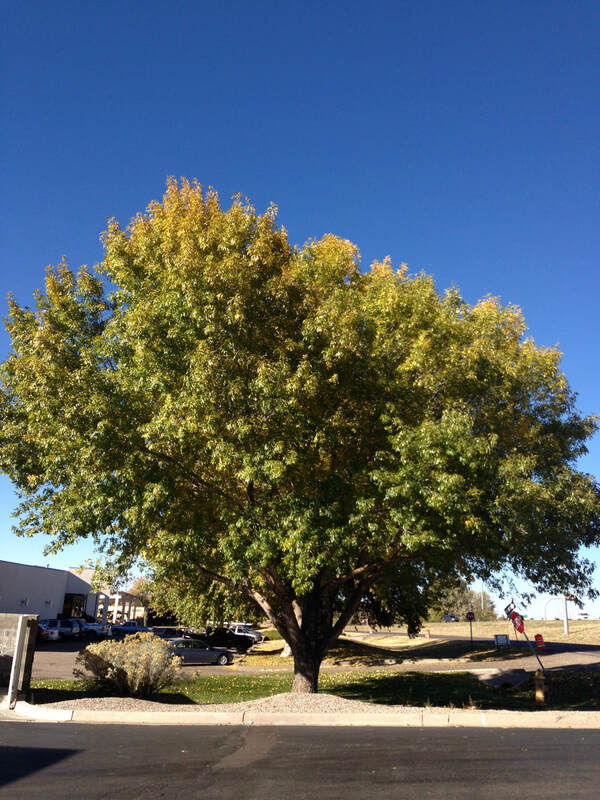 There are 3 key factors to consider when getting ready to trim your trees. So examine your tree branches periodically to see if you have these issues with your trees or even your shrubs. It's easier to spot when the leaves haven't fallen if you have a deciduous tree. But if you have an evergreen, be sure to check for insects and branches that are not putting out new growth. These may need trimming or a tree application. Many people believe that it's healthy to cut off all the major branches to just nubs, this is known more commonly as topping the tree. In reality you are actually damaging the tree when you top a tree this way. What is better for it is to trim crossing or rubbing branches, clearing out some branches in the center to allow for more air flow which is actually a great way to prevent our strong winds from knocking the tree over. (A dense tree works like a sail that catches the wind.) Trimming healthy branches is best done when the tree is dormant. Otherwise you run the risk of dripping sap. We know this from personal experience. It's no fun cleaning sap off your vehicle. Trimming is also about beauty. It's like getting a haircut, keeping the ends neat and clean. You want to be sure to trim branches in a way that enhances the tree. If you have low growing branches or perhaps growing down instead of up, you can guide the growth of the tree or shrub by strategically planning your cuts. Here are some examples of the different shapes you can have with a tree. All of these are healthy well trimmed trees as opposed to the tree above which is badly topped and the trunk is split. The tree could not be saved.